A simple and hearty vegan minestrone soup loaded with potatoes, carrots, and more veggies! It’s super quick and easy, and it takes just 30 minutes to make. A while ago, I mentioned wanting to include more savory recipes here on the blog, so here we go! These may be few and far between, or they may be more of a weekly thing, we’ll see how it goes. For now, I wanted to fill a void that I found when I was searching around for a vegan minestrone soup recipe last week, especially one that didn’t have beans as the main ingredient. Also, I play this game where I see how long I can go without going to the grocery store and use up what I have in the kitchen, so this easy minestrone soup was also a result of that too. 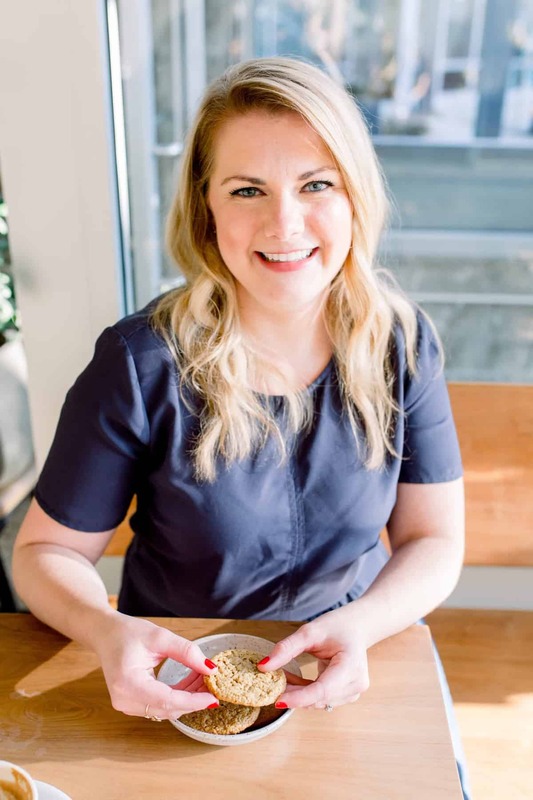 Plus, I really like when I can modify things I don’t love (like chunks of tomatoes and beans in soups) into a recipe that works with what I have. If I had almost bare cabinets and had the ingredients, I almost guarantee you also have all the ingredients for this in your kitchen too! Minestrone soup is highly underrated, in my humble opinion. It’s basically a hearty, pasta-laden soup that takes just 30 minutes to whip up and is a crowd pleaser every. single. time. To make this super easy minestrone soup, you first need to sauté some chopped carrots, onion, and potato in some olive oil (use a food processor to chop the veggies for you if you’re really in a rush!). Then throw in some garlic and continue cooking until fragrant. Once the veggies have a little color on them and have softened, add in the vegetable broth, crushed tomatoes, herbs and spices, and pasta. Bring the minestrone soup to a simmer and let it bubble away for 10 minutes, or until the pasta is fully cooked. And that’s it! 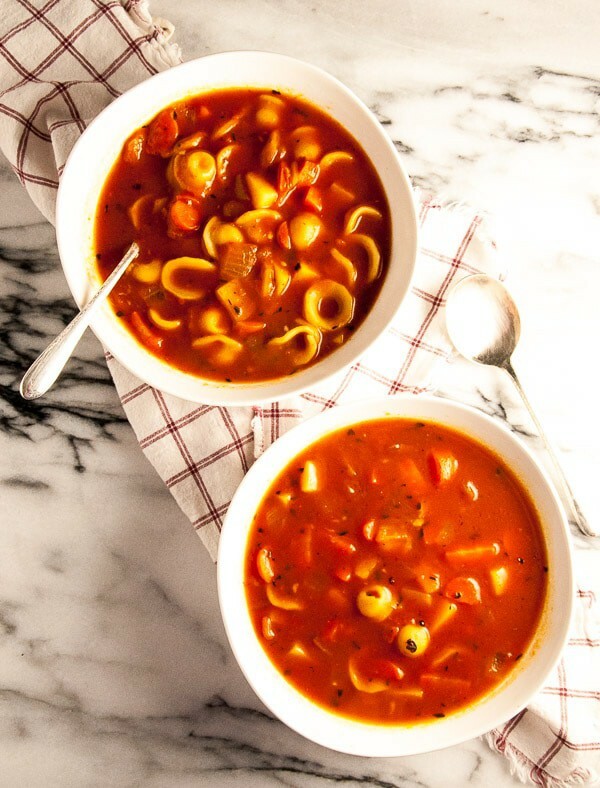 That’s all it takes to make a vegan minestrone soup—crazy, right? 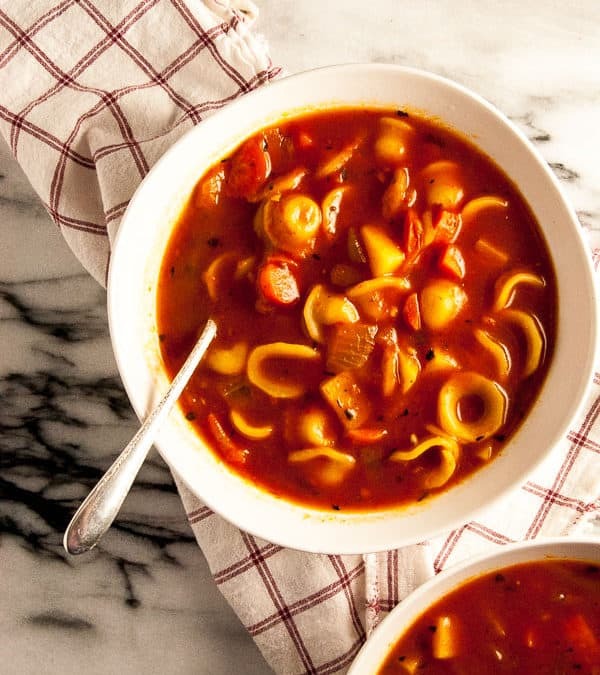 Oh, one word to the wise: it’s something to do with science, but things that are simmering with tomato in them start to get really bubbly and start splashing all over the place real fast, so keep an eye on this vegan minestrone soup! I left mine for a bit too long and now I’m off to scrub the top of my stove with lots of paper towels and all the elbow grease in the world. This minestrone soup keeps in the fridge for up to five days when stored in an air-tight container. Let the soup cool most of the way on your countertop before storing it in your fridge, though! 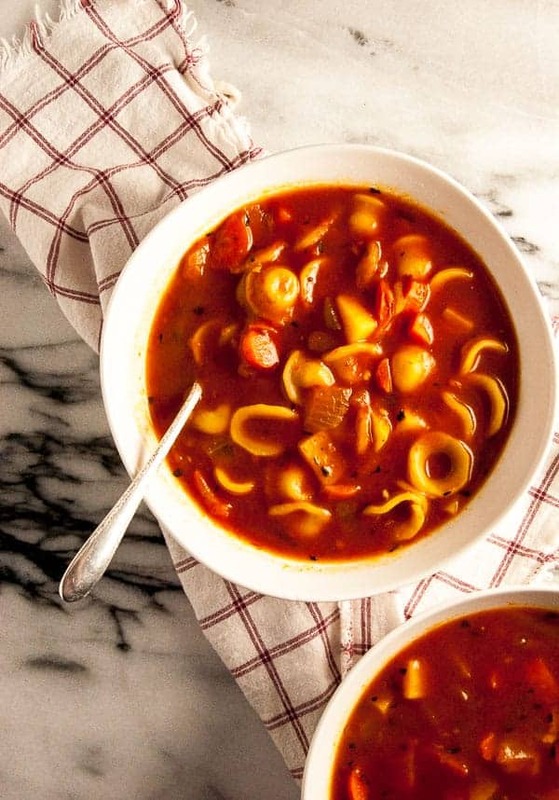 If you want to freeze this minestrone soup, I’d recommend making the tomato soup base without the pasta and freezing just that. When you’re ready to reheat the soup, add it to a saucepan with uncooked pasta and cook it that way. (Frozen pasta never reheats well, but this is a good way to get around that). In a large saucepan over medium high heat, heat the olive oil and saute the carrots, potato, and onion until tender, 3-5 minutes. Add the minced garlic and saute for another 1-2 minutes, until fragrant. Add the vegetable broth, crushed tomatoes, herbs, salt and pepper and pasta. Bring the soup to a simmer and allow to simmer on medium for 10 minutes, or until pasta is cooked through. Season with extra salt and freshly cracked black pepper. This looks like a tasty recipe I could do! I bet you could mom! Ohh, I am totally digging this no bean version of minestone. All we have been making for dinner lately are soups, so I am definitely adding this to my lineup! We eat this by the gallon! Well you nailed this savory soup! It looks delicious! Simple, hearty, comfort! Ah, this is savory soup heaven! A plus! Yummy! This soup looks really good. I love soup so I am going to try this soon! Hope you love it Heidi!! This looks delicious! My mouth watered just looking at it, so I’m heading out for a few ingredients I need. It’s 82 degrees here (in October!?!) but tempting is tempting, no matter what the weather! 🙂 thanks!